Cop Shiva (B.S. Shivaraju) was born in Bangalore in 1979. Cop Shiva began his artistic journey by joining the alternative art collective 1, Shanthi Road Studio/Gallery in Bangalore as a coordinator for this space. 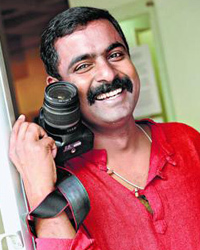 A member of the Karnataka Police Department since 2001 (which is also where he derives his artistic name) Cop Shiva, since 2010, has been dedicatedly working as a photographer. Cop Shiva began to document the complexity of rural and urban India, focusing on people and portraiture as a genre. He is fascinated with the idea of masquerade and the roles people play in public and private. One of his most acclaimed projects, shown at Art Heritage in 2013, involved documenting the life of a rural school teacher, Bagadehalli Basavaraj, as a Gandhi impersonator. This project explores the impact of Gandhi’s ideals on contemporary India. His second solo show at Art Heritage titled Ecstasy is set in Bangalore and is a panoramic view of the manifestations of myth and ritual, seen in the macro of society and the details of the ritual itself. These documentary images reclaim the threatened local identity by focusing on living traditions that are still part of urban life. His recent portfolio, Street as Studio is a series of intimate portraits of urban migrants, people of alternative lifestyle, street performers and others who virtually live in the hinterland of urban and rural conflict and thus Cop Shiva powerfully represents the condition of our times. Primarily represented by Art Heritage, Cop Shiva held his first solo exhibition My Life is My Message, in Delhi in 2013. Another solo at Art Heritage followed in 2014 (Ecstasy). Cop Shiva was represented by Art Heritage at the India Art Fair 2015. His work has been included in several group shows, both in India and abroad, including Chobi Mela (2013) in Bangladesh and the Kochi-Muziris Biennale (2014). His photos have been featured in different magazines including Wall Street Journal, Tasveer Journal and WOZ magazine. During 2016 he has been awarded a National Contemporary Art Award, 2016 by the Ministry of Culture and has been finalist in the prestigious Robert Gardner Award by the Peabody Museum of Harvard University. Most recently, Cop Shiva has been awarded the Studio Residency 2017-18 by Pro Helvetia Swiss Arts Council.